When is a fake not a fake? Sounds like a philosophical conundrum along the lines of “when a tree falls in a distant forest etc”, doesn’t it? But the answer is quite straight-forward. Context – I was having a conversation with a very well-connected art-world friend yesterday, and we were bemoaning the misuse of terminology when people refer to questionable works of art. ‘Forgery’: a work of art made to deceive. ‘Fake’: a work of art which has been identified as misattributed (credited to the wrong artist), but not in a way that was deliberately intended to deceive. So the terminology is very simple to grasp. No question at all that the paintings Beltracchi made – and it’s suspected that he may have made many thousands that have yet to be (and most likely will never be) detected – were forgeries. Example of a fake: I’m always pulling this one out as an example, but it’s so clear-cut it’s hard to resist. The National Gallery of Victoria’s painting-formally-known-as-Van-Gogh. It had been in the NGV collection as a work by the Dutch master since 1940, but in 2007, the Van Gogh Museum questioned its attribution, and declared it to have been made by hands other than Van Gogh’s. It was determined that it was made by one of his contemporaries, but that there was no intention to deceive by the misattribution. It was simply a case of mistaken identity. The Picasso print I have seen that is an original. No doubt. But at some point in its history, some turkey has decided it needed a signature and edition number to make it more marketable (for that, read ‘more valuable’). So the print, which was issued without a signature or edition number, is, and remains authentic. But the pencil signature and edition number? Forged. What does that mean for the authenticity of the work of art as a whole? The lovely little unsigned ink drawing that passed through Leonard Joel’s weekly auction room while I was running the art department that may (or may not) have been an original Charles Blackman. But in the absence of any supporting evidence, and given the vendor’s unwillingness to spend any time or money researching further, we had to give it the very wishy-washy, but safe, attribution ‘Australian School’. The drawing sold. Then reappeared a year and a half later. With the initials ‘C.B.’ inscribed on it in pencil. So we have what may – may – have been an original artwork, with a signature that was forged. What do you do with something like th at? What about the very common practice of restoring or repairing a work of art, or completing an unfinished work? How much is too much when it comes to ‘fixing’ an existing work of art? Rumours abound in the Australian art world about frequent and startlingly audacious ‘reworkings’ of paintings by some of the country’s best-known artists. But this practice is nothing new. Dealer Joseph Duveen, who was one of the grand-daddies of the modern art market, was notorious for ‘touching up’ the Old Master paintings he sold to his American clients. He did so to ‘prettify’ them and make them more appealing to late nineteenth and early twentieth-century sensibilities. 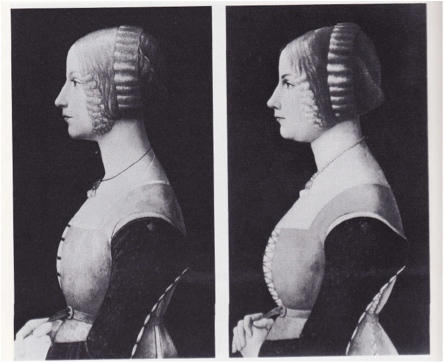 Witness the image here – Sebastiano Mainardi’s Portrait of a lady. On the right is the original image as crafted by Mainardi. The image on the left shows the painting as it appeared when sold to Andrew Mellon. Original/authentic or not? I could go on ad infinitum. But I shan’t. I’ve bored you enough already. Suffice it to say it is a very, very fraught area.